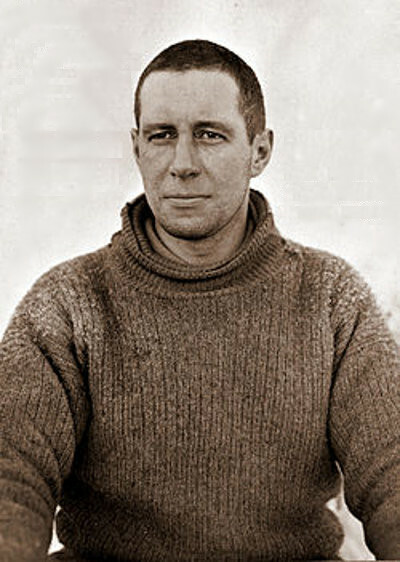 Oates is known for the manner of his death during The Terra Nova Expedition, when, he walked from a tent into a blizzard, with the words "I am just going outside and may be some time." His death is seen as an act of self-sacrifice when, being aware that his ill-health, was compromising his three companions' chances of survival, he chose certain death. Oates was born at London. He came from a wealthy family. He went to Eton. In 1898, Oates joined the British Army (most of his fellow explorers were navy). Transferred to the 6th (Inniskilling) Dragoons in 1900, he saw service in the Second Boer War as a junior officer. He was promoted to Lieutenant in 1902, then to Captain in 1906. "In March 1901, during the Boer War, he suffered a gunshot wound to his thigh which left it shattered and his left leg an inch shorter than his right leg when it eventually healed." He later served in Ireland, Egypt, and India. We might get some insight into Oates's character when we consider the story, I think it was during the Boer War: During a skirmish he was twice called on to surrender, and replied "We came to fight, not to surrender." Wikipedia has it, that, in 1910, Oates applied to join Scott's expedition; and that he was "accepted mainly on the strength of his experience with horses and, to a lesser extent, his ability to make a financial contribution of �000 (2008 approximation �,000) towards the expedition." Scott further wrote of Oates, "The Soldier is very popular with all -- a delightfully humorous cheery old pessimist -- striving with the ponies night and day and bringing woeful accounts of their small ailments into the hut." "Of these three [referring to Wilson, Evans and Bowers] it is a matter for thought and congratulation that each is sufficiently suited for his own work, but would not be capable of doing that of the others as well as it is done. Each is invaluable. Oates had his invaluable period with the ponies; now he is a foot slogger and goes hard the whole time, does his share of camp work, and stands the hardship as well as any of us. I would not like to be without him either. So our five people are perhaps as happily selected as it is possible to imagine."